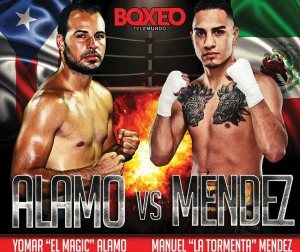 Miami, FL: Rio 2016 Olympian Antonio Vargas is set to return on the Boxeo Telemundo Ford undercard, with the show celebrating it's 30th anniversary. The 1st of 4 installments airing in back to back weeks, will kick off Friday, February 22 from Osceola Heritage Park Events Center in Kissimmee Florida. WBO #15 Antonio Vargas (9-0 3 KO's) is fighting for the 7th time in his hometown of Kissimmee. Vargas, is the current NABF Jr bantamweight title holder, having claimed the vacant title in his last outing against the tough Mexican contender Jorge "El Wero" Perez. Vargas returns to the Telemundo airwaves, this time he defends his title against Wilner Soto (21-5 12 KO) of Canalete, Colombia over 8 rounds. The young olympic prospect looks to start off the year with a strong first defense and continue his trend in the pro ranks. John Karl Sosa (13-3 6 KO's) of Caugas, Puerto Rico is making his return to the ring after a one year layoff. His comeback fight will be a classic battle of Puerto Rico vs Mexico as John Karl is set to face Alejandro "Bad Boy" Barbosa (11-3 7 KO's) of Jamay Jalisco, Mexico. Sosa looks to bounce back after suffering a hard fought 10 round split decision loss to world ranked contender Rashidi Ellis. The special attraction bout of the night features rising middleweight prospect Carlos Monroe Jr (11-0 8 KO's) squaring off against Jonathan "Oso" Tavira (17-6 13 KO's)in a 10 round bout. The show is rounded off by a battle of lightweights. Emmanuel "Tito" Morales (9-3 5 KO's) faces Pedro "Perico" Amigon (6-11) over 6 rounds. Vargas vs Soto is brought to you by Top Rank, in association with All Star Boxing, INC.